A State of Emergency was declared in August as Florida’s southern Gulf Coast is overwhelmed by an unusually persistent environmental phenomenon called a “red tide”. In a part of the world where red tides are common, this particular bloom has lingered for over 10 months and intensified in recent months. The latest indications point to the red tide having extended east, into the Atlantic. At the same time, Florida grapples with a toxic blue-green algal bloom in its freshwater systems. It’s tricky to distinguish what’s red from blue in this complex ecological crisis, so here we break down a few of the things you need to know about the red tide right now. Look out for future conversations about the blue-green algal bloom, which Governor Rick Scott declared as a separate State of Emergency in July. “Red tides” happen when populations of microscopic marine dinoflagellates grow and concentrate in an area, discolouring the ocean so that we see red or brown water at the surface. The colour you’re seeing in the ocean is the result of super high concentrations of these organisms – sometimes up to 20 million cells in a single litre of seawater! 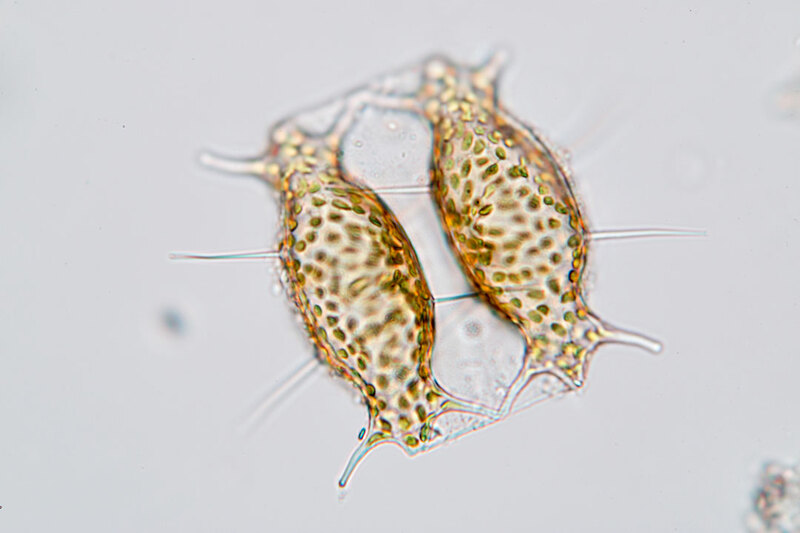 Dinoflagellates are single-celled organisms that don’t quite belong to either the Animal or the Plant kingdom (read more). Rather, they’re what scientists call protists. These are really tiny cells, usually only visible as individuals under a microscope (some of the biggest grow to a whopping 2 mm!) and most (90%, according to the Latz Lab at Scripps Institution of Oceanography) are found in the ocean’s water column as part of the marine plankton community. Many dinoflagellates manufacture their own food using energy from sunlight; they are photosynthetic (read more). How exactly scientists classify these little cells is a bit complicated, but for the most part you’ll see them grouped together as marine plankton, algal blooms, or, when they are toxic or detrimental to the environment, “Harmful Algal Blooms” (HABS) (read more). HABS can refer to blooms from both marine and freshwater algae. The right quantities of nutrients in the water? The right ocean temperatures? Scientists aren’t totally clear on all the exact cues in the environment that cause red tides (read more). Some scientists note that an upwelling event or mixing of the water after a storm might stir up dinoflagellates lying dormant on the seafloor (read more). If there’s sunshine to warm the surface waters, a bloom might result and cells replicate very quickly, eventually crowding the water and changing its colour. The Florida Fish and Wildlife Service Commission report that scientists haven’t explicitly shown a link between nutrient pollution from humans causing red tides to start (read more). Red tides can and do happen in the absence of human-induced nutrient loads in the system: often, they develop further offshore and are blown towards the coast. However, once the red tide is inshore, the higher levels of nutrients in the water close to the coast as a result of pollution can actually help dinoflagellates grow and reproduce. Nutrients inshore might help maintain the red tide conditions. The compounded effects of climate change and nutrient pollution might also change the way we’ve been used to seeing HABS occur in the past: scientist suggest that some blooms might become more frequent, persist for longer and be more intense (read more). So, who is the guilty single-celled organism? Neatly square in shape with rounded edges, the single little cells of the species called Karenia brevis (read more) looks unassuming enough under a microscope. In the ocean, they would almost be invisible to the naked eye; until they accumulate and concentrate en masse, and bloom. This colours the water its tell-tale red, lending the tide its popular name. It’s the dominant dinoflagellate in the waters around Florida and is found almost exclusively in the Gulf of Mexico from Mexico to Florida. Red tides can happen in the ocean all around the world, and not all of them are toxic or harmful. In fact, the National Oceanic and Atmospheric Administration (NOAA) reports that fewer than 1% of blooms are harmful (read more). In some cases, red tides aren’t toxic, but the sheer concentration of dinoflagellates in the water can deplete oxygen levels and kill other marine wildlife in the ecosystem. However, you might have noticed certain seafood choices off the menu at your local restaurant if an area has recently experienced a red tide. Filter feeders like mussels or clams might well filter toxic dinoflagellates from the seawater and their own tissues become toxic. Not quite the bowl of clam chowder you want to chomp! There is a small percentage of dinoflagellates that do produce toxins (read more). Some dinoflagellates produce neurotoxins that damage the nervous tissue in other species. 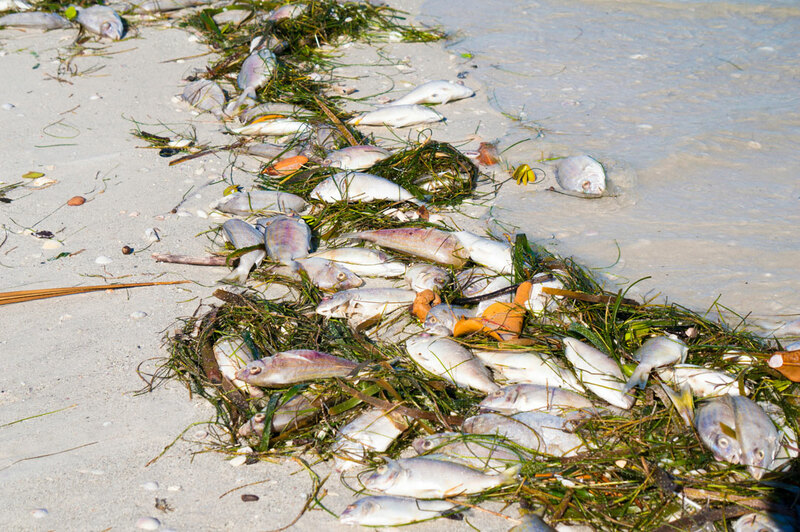 In Florida, Karenia brevis kills ocean life and causes sickness in human beings because its toxins result in neurotoxic shellfish poisoning (read more). That’s why it’s really dangerous to eat shellfish during a red tide: the recreational collection of shellfish would be banned during a red tide event, and commercial shellfish fisheries have strict monitoring protocols. Karenia brevis also produces brevetoxins. This toxin is suspended in the air when it’s released as an aerosol as the little cells of K. brevis are battered around in the surf. This can blow towards the beach and cause respiratory problems in human beings (read more). Why is everyone talking about this red tide? Red tides in Florida are nothing new (read more): the Florida Fish and Wildlife Commission report that there is evidence from the 1700s pointing to red tides in the southern Gulf of Mexico. They even note that Spanish explorers apparently recorded dying fish washing ashore in Tampa Bay, in their accounts of the region. The Florida coast experiences red tides almost every year, peaking between September and February. They vary in how long they persist, and this particular one has been off Florida’s coast for over a year. According to NOAA, what makes this red tide newsworthy is that its timing, duration and extent are exceptional (read more). This red tide started offshore earlier than usual in October 2017, intensified and moved closer to Florida’s coast in June this year. This particular red tide has really high concentrations of Karenia brevis in the water: scientists classify it as high when there are over 1 million cells per litre of seawater. Those high counts are stretched over 100 to 150 miles of coastline in the region. Scientists can’t say when it will end, but monitor its development (read more) and spread (read more). So what is happening to ocean wildlife? The toxins from Karenia brevis can impair breathing for ocean wildlife, and fish have been washing ashore for months on the coast. Florida Fish and Wildlife Conservation reported 97 manatee deaths (read more) according to The Guardian in August. As the effects of the red tide creep up the food chain, scientists have noted fish, turtles, dolphins and a whale shark washing ashore (read more). 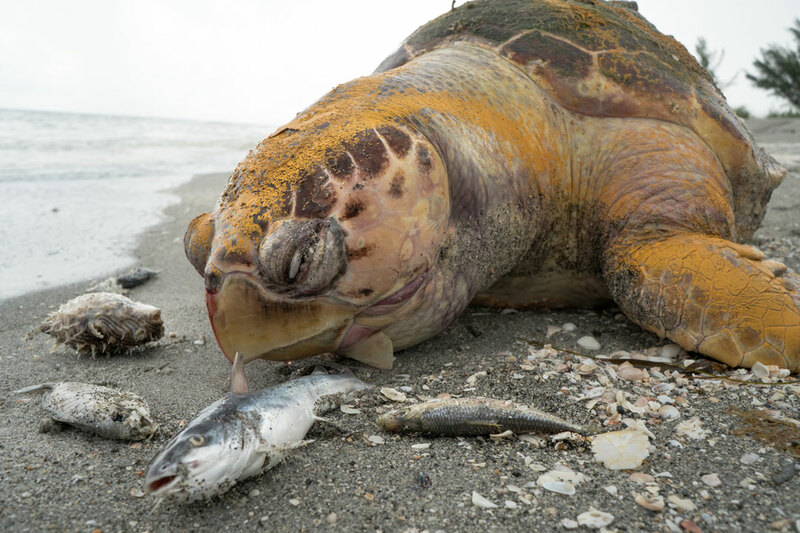 While authorities wait out the red tide, hoping that winds might push the tide further offshore again, plenty information is being made available on what to do if you find stranded animals or dead fish washing ashore (read more).